Microsoft has announced upcoming Black Friday deals for its Xbox devices and services. “The holidays are almost here, and Xbox is back this year with our biggest Black Friday sale ever,” said Microsoft on its website. Selected consoles, games and Xbox memberships will go on sale. Microsoft will be offering a US$100 dollar discount on selected Xbox One bundles from 18 – 26 November. Though the company has not confirmed all qualifying bundles, the Xbox One S Minecraft bundle is included. Get a digital Gears of War token to the value of US$39.99 when you buy a One S, One X or Xbox Wireless controller. Get a US$10 discount on new Wireless controllers, including selected controllers from the company’s design lab. In honour of Black Friday, you can join Microsoft’s gaming catalogue Xbox Game Pass for a single dollar between 10 November and 3 January. The deal, which will give you access to over 100 games for free, only lasts for a month. Afterwards, the regular US$10 fee will apply. Xbox Live Gold, which is the brand’s online gaming platform, will also be available for US$1 for the first month you join between 15 and 30 November. Save 40% on a three month subscription to Xbox Live Gold, available from 22 – 26 November. 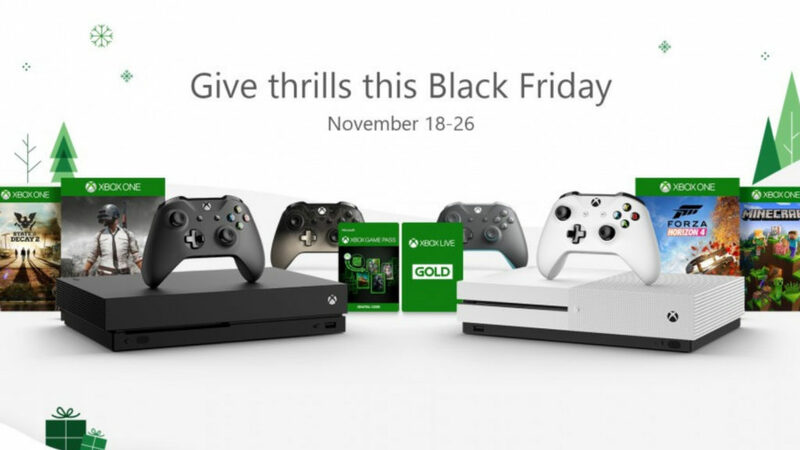 “What’s more, Black Friday kicks off even earlier for Gold members, with great deals on Xbox digital games, with Early Access beginning on 15 Nov,” Microsoft notes further.